Record-low natural gas prices, increased national security and economic growth. Those benefits come from recent surges in drilling, the result of technological advances in hydraulic fracturing and horizontal drilling that opened up vast reserves of previously inaccessible oil and gas in shale formations across the country. According to the American Petroleum Institute, oil and natural gas industry operations directly and indirectly supported 8.4 million jobs in 2011 and the industry’s capital investment resulted in an additional 1.4 million jobs. Wages associated with both totaled an estimated $597.6 billion and the industry’s total value-added national impact was $1.2 trillion that year. The environmental picture is not so rosy, however. The surge in drilling also brings concerns about water use, potential surface and groundwater contamination, increased seismic activity, air emissions and impacts to wildlife and habitat. Many experts agree we have the ability to balance a healthy energy industry with appropriate environmental protection. Two areas of focus now are addressing methane emissions and minimizing the impacts on endangered species. Oil and gas production is hardly new, nor are fracking and horizontal drilling, pointed out Jeff Civins, a 1975 graduate of, and adjunct professor at, The University of Texas School of Law, and a partner at Haynes and Boone. But employing them together on a large scale is new, which, in turn, creates new issues. 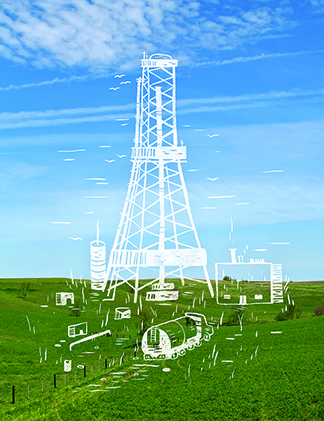 Fracking recovers oil and gas from formations previously not considered viable for production. But the ramped up production that resulted is responsible, in part, for making oil and gas drilling the nation’s single largest source of methane emissions, the second most potent greenhouse gas (GHG). Drew Nelson, senior manager for natural gas at the Environmental Defense Fund, said recent studies have shown actual oil- and gas-related methane emissions are higher than many previous estimates. “Couple how potent methane is with more methane leaking than we thought and that is very troubling.” Controlling methane emissions from oil and gas operations is critical to ensuring that substituting natural gas for coal in power generation creates a net environmental benefit, Nelson said. Methane escapes during the well completion process and from leaky pipes, valves, pumps and other production equipment. A study (1) jointly funded by EDF and nine natural gas producers measured methane emissions from completion of fracked gas wells. According to principal investigator David Allen, chemical engineering professor at UT’s Cockrell School of Engineering, data show that a small subpopulation of devices accounts for the vast majority of emissions. Identifying and controlling these sources would produce maximum results for the investment. In addition to reducing the environmental footprint of oil and gas production, controlling emissions would also improve the industry’s bottom line. The value of previously-lost product often would cover the cost of reducing emissions, according to Nelson (2). “Technology already in use can cut methane emissions by 40 percent at a cost of less than one penny per cubic foot of gas.” Depending on market price, that could add between $1 and $5 billion to the industry’s bottom line. On the environmental side, it would eliminate emissions equivalent to 112 million cars or 140 coal power plants. A Society of Petroleum Engineers study (3) also recognized the potential for oil and gas companies to reduce overall GHG emissions and improve efficiency by reducing methane emissions. One barrier to accomplishing this is lack of infrastructure, particularly in areas with little previous or recent production. Texas’ Eagle Ford shale, for example, produces more than 4,000 barrels of oil per day, and pipeline and storage capacity are inadequate to manage the natural gas from those oil wells. That necessitates flaring of the gas, which results in significant emissions. “We are in a transitional phase,” said Kinnan Goleman, president of Austin-based regulatory and legislative services firm KG Strategies. “We have to build infrastructure in order to control assets from an environmental standpoint.” Emissions associated with shale development will continue to decrease as infrastructure increases, he said. Not everyone agrees the market will solve the emissions problem, however. Smaller companies don’t always have the resources to invest in appropriate technologies, Nelson pointed out, which he sees as an argument for using government regulation to drive emission reduction. Another issue of increasing concern to scientists and environmentalists is the effect of oil and gas drilling on species listed on the federal Endangered Species Act (ESA). When an activity affects such a species, resulting permit provisions can be expensive and time-consuming. That plan includes recommended measures industry can follow to avoid affecting the bird and mechanisms for mitigating unavoidable impacts. The lesser prairie chicken lives in Texas, New Mexico, Oklahoma, Kansas and Colorado, so oil and gas operators in those states have the option of participating in the range-wide plan to avoid being otherwise liable if their activities affect the species. “As long as an operator is in compliance with a range-wide plan, FWS will not prosecute for take,” Taylor said, even if their operations harm the bird. Under the ESA, “take” includes harassing, harming or killing an animal. The process is meant to be more streamlined and simpler than a federal permitting program administered by FWS. Environmentalists question whether the FWS’s oversight is sufficient, however. National environmental groups Defenders of Wildlife and The Center for Biological Diversity are challenging the plan in court. 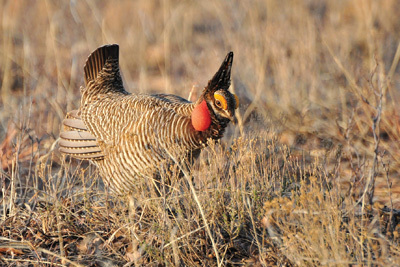 The lesser prairie chicken population hit a historic low in 2013 of 17,000. Interests on all sides express concern about using the ESA to regulate energy production and some question whether Congress intended the law to shut down development. “The concern is whether, and to what extent, the Endangered Species Act is used as a tool to restrict development, to make land use decisions or shut down development rather than protect species,” Civins said. The ESA requires that listing decisions be based solely on the best available science, however, without considering economic impacts. “Congress did not make economics part of the equation in listing decisions because the question of whether a species is endangered or not should be entirely based on science; that is, what is known about the status of the species and whether it is at risk of becoming extinct,” Taylor said. Once a species is listed, though, decisions about how to best help it recover can, and should, take economics into account. Environmentalists express skepticism about the effectiveness of conservation plans as well. David Wolfe, EDF’s director of conservation strategy, sees the piecemeal approach of the regulation as a problem. “One company negotiates some kind of deal for mitigation, than another company comes in later and works out a different deal. There’s no common rule for everyone.” The result is unpredictability for industry and uneven protection for species. The ESA has reduced the rate and number of extinctions, according to experts on the act. “It has been successful in staving off extinction, forcing people to think about the impacts of human activities on species and being more careful to reduce the impact,” Taylor said. She pointed out popular ESA successes, including full recovery of the bald eagle and dramatic increase in the number of whooping cranes, brown pelicans and American alligators, among others. Conflicts between endangered species and energy production are likely to continue. Another rare species affected by oil and gas development is the dunes sagebrush lizard, whose habitat occupies southeast New Mexico and West Texas in the heart of the Permian Basin. Intense, protracted negotiations between the oil and gas industry, FWS and the Texas State Comptroller’s office in 2012 resulted in FWS not listing the lizard in return for the Comptroller implementing a voluntary conservation plan to protect the animal. Environmental groups have challenged the plan in court. The sage grouse, proposed for a “threatened” listing this fall, inhabits 11 states across 120,000 square miles, much of it targeted for oil and gas drilling. FWS is considering measures to reduce the effect of energy development on the grouse. “The lesser prairie chicken lives in grasslands of the Great Plains and the sage grouse in sagebrush of the American West,” Wolfe said. “These are elements of our natural heritage, and it is important to protect and conserve as much of it as we can. That is good stewardship. Also, if the birds are doing well, that is a good indication that so are those ecosystems, which we depend on for air and water quality and carbon sequestration, things important to our daily life.” Protecting habitat also directly benefits those with a vested interest in a particular ecosystem, such as hunters or outdoor enthusiasts. There are benefits to the corporate bottom line, too. 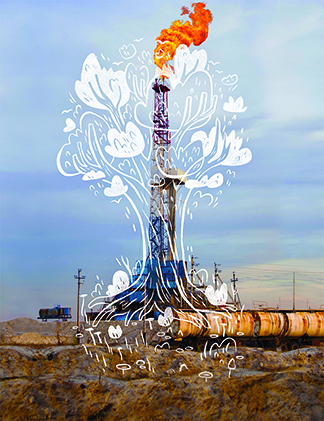 Companies can point to effective protection of the environment as proof they are responsible corporate citizens, according to a report from Baker Hughes (5). Their efforts can also build relationships with communities and other partners. The key is striking a balance with protecting the natural environment so society can enjoy those benefits now without paying too high a price down the road. Measurements of methane emissions at natural gas production sites in the United States. ICF methane cost curve report. Development of a profitable greenhouse gas emissions reduction strategy. Biotic impacts of energy development from shale: research priorities and knowledge gaps. Wetlands and endangered species management.